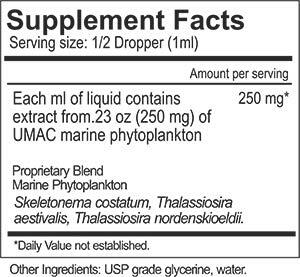 Harvested from the bountiful Strait of Georgia just off the coast of Vancouver, Canada, the marine phytoplankton in UMAC-Core is a truly unique ingredient. Born of years of research, UMAC-Core provides a blend of ocean derived amino acids and minerals. This natural product offers an excellent source of micronutrients. What makes UMAC-Core different from chlorella, spirulina, blue-green or any other algae is that UMAC-Core marine phytoplankton is wild-harvested, contains multiple species and the patented process ruptures the cell wall, so the nutrients can be accessed and utilized. Marine phytoplankton have a hard plant cell wall our bodies cannot digest. UMAC-Core® contains extracted microscopic nutrients for best absorption.